This review is of Episode 1. 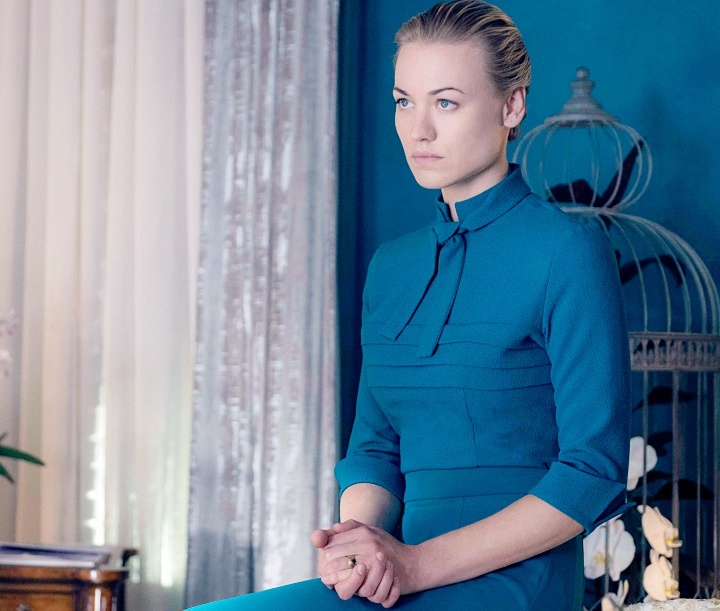 It’s impossible to be a woman watching The Handmaid’s Tale and not be deeply affected by what you see onscreen. Every woman should see it, every person should; hell, make your pets watch it. Margaret Atwood’s novel has always been a cautionary science fiction story, but in this particular moment, it looms, threatening to become reality if we allow. Regardless whether, as some seem to think, its stars were told not to harp on feminism in order to draw more people to watch Hulu’s faithful adaptation, nobody can avoid or disavow that of course, this is a feminist story. 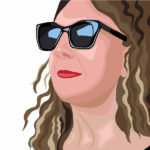 In fact, it is so much so that for the first time, I pondered whether a male reviewer would or could possibly feel what I did, not unlike what raced through women’s hearts when we saw that ubiquitous photo of Trump and his cronies gathered round a table to make decisions about our reproductive rights. That picture was an emotional gut punch, and so is The Handmaid’s Tale. The future is ugly. Our government overthrown (or killed), fundamentalists have instituted and strictly enforce their worldview. 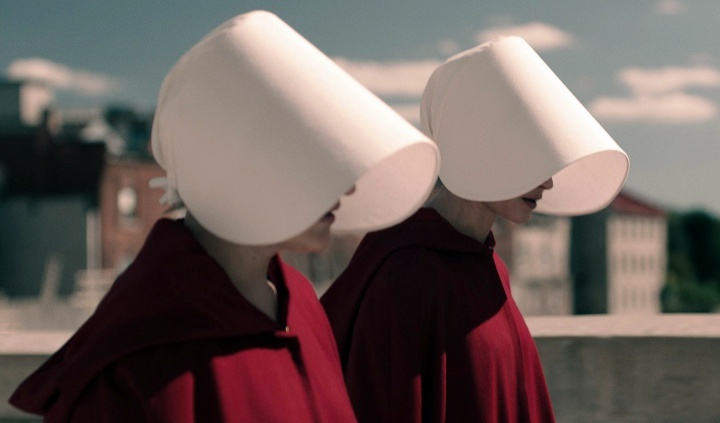 Under the Republic of Gilead, women are regulated property, lose their identities and are segregated into groups by the tasks they’re deemed worthy of performing. Thrown right into her quick capture as if some prized woodland creature, it’s the shots of normalcy interspersed with Offred’s (Elisabeth Moss) new life that offer deeply moving context. Flashbacked scenes are a shot of adrenaline, reminding how not-so-far-from-everyday-reality her now locked-down existence is, what our own could be. 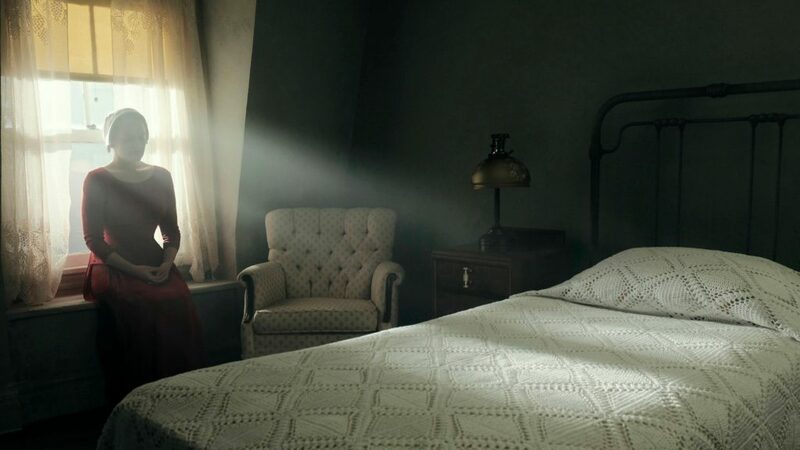 We share Offred’s desire to close our eyes, to go back to before, back to how any of it could possibly have started, back to remember who she used to be … the family she used to have. As we watch Offred run through the woods with her too-big-to-carry child, our hearts are pounding faster — faster than observing the usual fictional thriller — as she’s pinned down by gun-wielding goons, I could almost feel myself being held down, crying and screaming in disbelief as the whole world comes crumbling. I’d be lying if I said the pilot didn’t produce unexpected and uncontrollable physical reactions, and most of that was due to Elisabeth Moss’ exceptional and riveting performance. Director, Reed Morano (Meadowland, Billions, Halt and Catch Fire) hones in on Offred’s face throughout, catching individual blinks and twitches as she must somehow contain her every natural response, each thought that threatens to escape while under watchful Eyes (secret police), and later a release of breath, free-running thoughts and memories she hasn’t even had time to fully form when she has moments alone. Putting together pieces, reacting to what we see and hear, we are Offred; she is us. Rifling disorderly through her timeline is purposefully discombobulating, creating an often immersive experience. 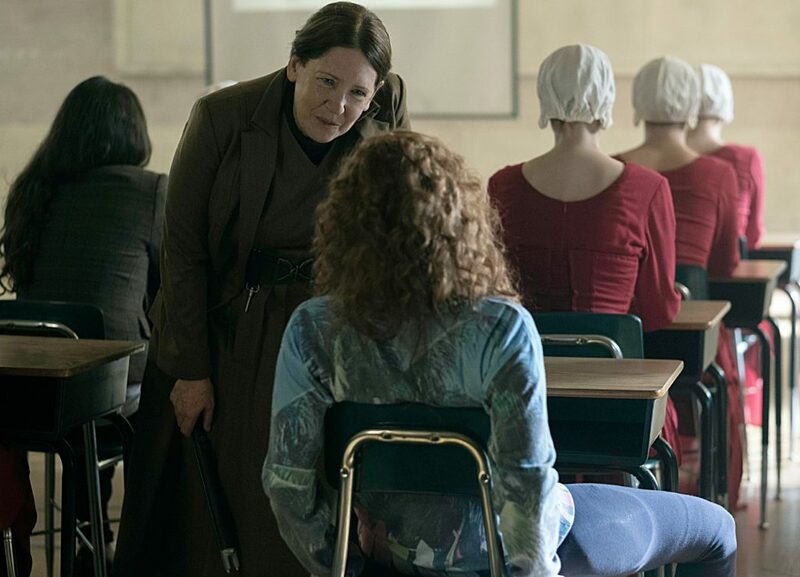 Thrown into a warped classroom environment that more demonstrates, than explains the new world order, viewers face the horrors right alongside Offred, meeting a perfectly cast and often terrifying Aunt Lydia (the phenomenal Ann Dowd) just as Offred did, we share simultaneous and similar reactions to everything she sees. What would we do? Could we fare any better? By the point she’s dropped into her own current story, things are already too far gone, and some lingering unknown hope — for what? — is all that’s left. Survival may be all that’s left, and with no chance of reuniting with anyone she loves, it’s a more instinctive design than a driven one. Even her dearest college friend, Moira (Samira Wiley) — who sets a horrific example of what Offred should … (must?) become — is both comforting, and a stranger to Offred, now. There are no winners here, in this Gileadian land. 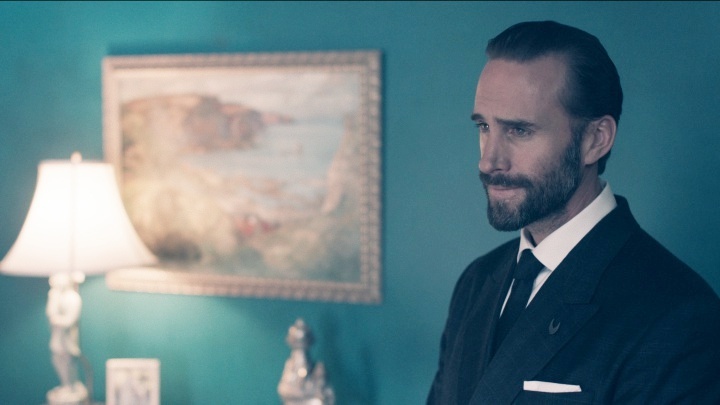 The “important” Commander (Joseph Fiennes), and husband to whom she’s assigned, seems nearly as miserable as his broken-hearted (and aged down from the novel) wife, Serena Joy (Yvonne Strahovski). Even the gleeful actions and passionate declarations a fully-immersed Lydia makes are offset by her apparent pain at those who would defy the rules. Rita, the “Martha” (Amanda Brugel) trudges robotic through her household chores, fellow Handmaid and shopping partner, Ofglen (Alexis Bledel) keeps her “pious” head down, Janine (Madeline Brewer) is cruelly taught submission and in this true dystopia, only the Commander’s possibly mischievous (or maybe, an Eye) driver, Nick (Max Minghella) shows any spark of life at all. And, if you’re a reader wondering whether they go all the way with “the Ceremony”, why yes; you’ll see it in all its horrifying and cringe-worthy glory, as well as that disturbing “Particicution” Salvaging (execution). In so many instances, book readers wonder if a film or television series can live up to inspiration and more often than not, there is something lacking. At its Tribeca premiere, as the opening sequence rolled, I wondered what the show could offer that Margaret Atwood (who has a wonderful cameo) hadn’t already given us, and less than an hour later, after a few tears had impolitely and silently slipped down my cheek, I realized that there was indeed something in this adaptation I hadn’t foreseen. Both times I’ve read Atwood’s engaging, well-told story, I could stay at arm’s length — feel detached from it all. But, seeing the Republic of Gilead played out in front of me, freedom taken away, families and children ripped apart … how quickly a fanatical, controlling group could turn people’s lives around; this created an unwelcome tightening around my heart. It was something I hadn’t experienced through reading. 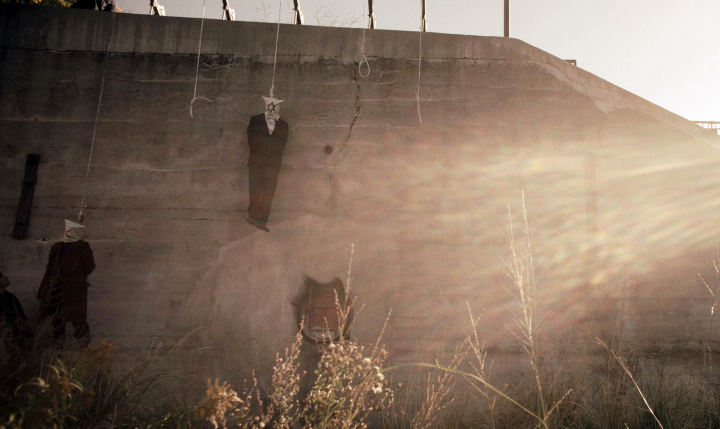 Bruce Miller, Morano, Moss, Dowd, Wiley and the rest of the incredible group of actors have made Atwood’s “speculative fiction” resonate in a new way, sent a tingling to my nerve endings, like when a limb has fallen asleep and sends your body a resolute warning — it truly is time to wake up. The Handmaid’s Tale is written by Margaret Atwood and Bruce Miller, with episodes 1 – 3 directed by Reed Morano, and stars Elisabeth Moss, Joseph Fiennes, Max Minghella, Alexis Bledel, Ann Dowd, O.T. Fagbenle, Samira Wiley, Ever Carradine and Yvonne Strahovski.